SD card from popping out in crash. Anti-interference PCB can effectively reduce RF interference. honestly, I think that when they read this review, they'll delete it. assuming they just pre-screen all reviews, and if they do it definitely won't get posted. that's ok, I'll be posting it on google, amazon, etc. plus a ton of paintball groups I belong to. at any rate,m here we go. the battery door is extremely tough to remove at first. I had to grab a dime and lever it out of it's locking dogs the first time. but, after repeated use, it's gotten much easier to remove. this makes me wonder if it'll continue to get loose as time goes by, and eventually fall off. we shall see. to me, this really doesn't seem to be a secure way to lock the compartment. Drift cameras have a screw in locking mechanism. others have a snap system. this is just locking dogs that slide into the frame. decent enough, but over time I see them wearing off or simply breaking.again, we'll see. the shell is plastic. not thick plastic either. it flexes, it bends, it can be crushed, snapped, broken...simply by hand. so, the "protective case" really isn't. the lens is completely exposed. there's no protective cover for it, no external protective shell for it. so, if it gets hit be anything, it's more than likely going to break. the mount is the same plastic. flimsy feeling, with a snap clip at the front that inevitably breaks off due to the poor material used. to mount to a camera screw mount, you need to snap in a little piece that locks into the bottom of the camera mount itself. this, again, is flimsy and feels very, very cheap. I'm very, very conscious of this when it's mounted to the side of my mask. so much so that I've used the strap mount to mount a strap that connects directly to my mask so if it does break, I won't lose my camera. battery life could be better. you get, at best, 60 minutes. but, be prepared for more like 40-45 minutes of recording time. I suppose this is ok with this size of camera. but, I ran Drift Innovation cameras before these and got far superior battery life from them. wifi connecting could definitely be better. there's things you must do in order for it to work properly, or at least I had to. I tried on my cell phone, and I had to turn off data to get it to connect properly. so, I found an old cell to use instead. same thing. wifi cannot be connected to anything but this camera, and data must be turned off. the manual and general instructions are a joke. worst written manual I've ever seen. the app for cell phones is decent enough. it allows you to use all functions for the camera, and it actually works pretty well. but, there's issues. for example the orientation just doesn't work. so, if you turn your camera upside down, it will either just not flip the picture, or only flip it once and refuse to go back if you re-orient the camera. you usually need to do this manually, which is kind of annoying. the picture is actually pretty good. it's better than the Drift cameras I used to own, but not as good as the new Drifts or a GoPro. but, it's still pretty good. sound is good as well. it picks up a lot of sound from around me. you can hear, and understand, when someone is speaking. so, that's nice as well. overall, this isn't a bad camera. it's an $80 camera, and to me it's over priced. should be around the $50 price point at best. 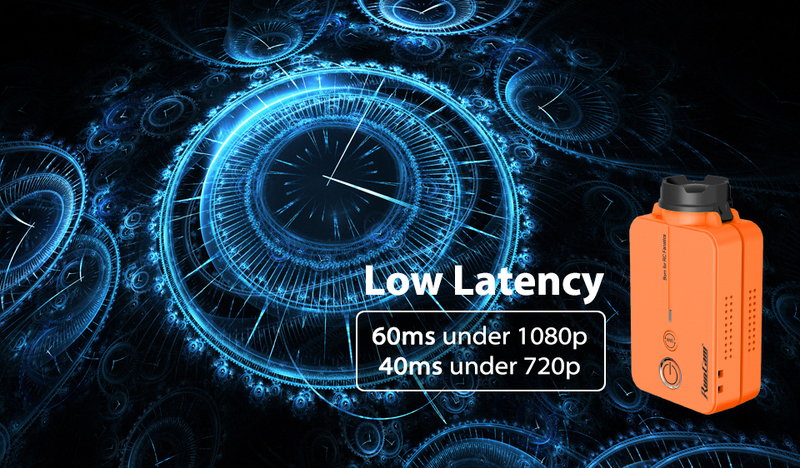 Video quality is pretty good for its compact size. Great for airsoft, drones and rc vehicles. Love how easy it is to swap out lenses. Is very little but the quality of image is very good. At the moment is the best cam with the best price, thanks ! The camera is very good. Video is pretty good however it runs hot after a few minutes of recording. Would love to see if it there's a firmware update to increase bitrate, get 240FPS and still be able to run cooler than now. Camera seems to work well. Good pictures. However the User Manual is very poor and should be revised to give the user confidence in operating the device. Otherwise it seems just guess work as to what the camera is capable of. Good product , Record and captue quality is excellent , i will arrange that can for scope cam with when i play airsoft. This camera is good ! Small, light, with a good resolution. Smallest problem : bugs with RunCam app. When the app don't respond, 2 buttons don't work. I must remove the battery to reset him. Charge is good ! Good autonomy. Very nice screens, videos. I really like everything about my RunCam2 170 degree FOV camera. I like the app as well and I can adjust the FOV down and get less of a fish eye lens effect if you like. The picture is really clear when reviewing the footage afterwards at home on a big screen tv. I mainly use mine for fixed wing models such as flying wings as the form factor is perfect. Thanks RunCam for a great product. I purchased my RunCam 2 a couple of months ago. It takes beautiful videos I also downloaded the App on my 8" Amazon tablet and it works great. 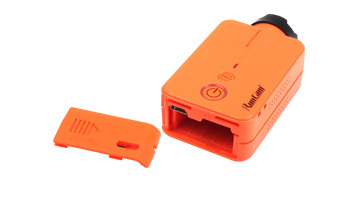 I bought my RunCam in Orange for better visibility on the front of my quadcopter and in case I drop it somewhere. For the price you can't beat the quality. I also am going to use it as a car cam.Don't be afraid to purchase it. I love this cam, easy to use and the result is perfect ! This is the wide field of view model with FOV of 170 degrees. 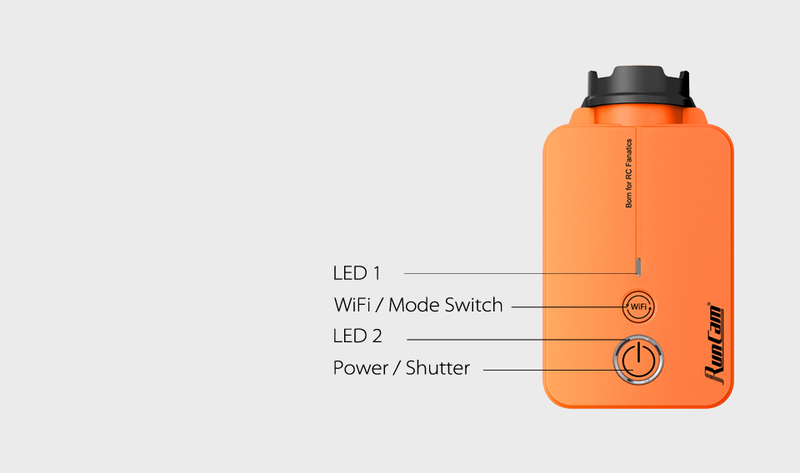 It captures all of the important stuff with ease. I am using it mostly with the hobbyking quanum V2 docking station with builtin transmitter. It is good enough for using the broadcast for FPV. It also records the flight if I start the camera before each flight. I also have a go pro hero4 but is is more expensive so I do not risk flying with it and besides the runcam2 video covers a wider swath than the go pro and has better quality besides. I love my runcam2 and plan to get another or perhaps the runcam3 cube. By far this is the best value for a small HD action camera. GoPro is still the Cadillac but you pay a price for it. I know I feel better knowing I only paid $80 for my camera since the tree doesn't care how much I paid for it. Just having the option pairing the cam with ones phone makes it worth while having. If I compare the 2 cameras, I do think this is the better one. Picture quality is definitely better. Having access to the battery is also a great improvement. Overall 4 out of 5. Franchement caméra au top, la qualité d'image est vraiment là. Il s'agit ici d'un must have pour mettre sur mes multirotors et ailes volantes. Pourquoi 4 étoiles uniquement ? Deux points négatifs: le son qui est vraiment pas terrible et l'ouverture de la lentille qui gagnerait à être un poil plus grande. Best HD camera to use on my FPV model (quad and wing). Two little problem: not a good micro and lens angle sould be a little wider. 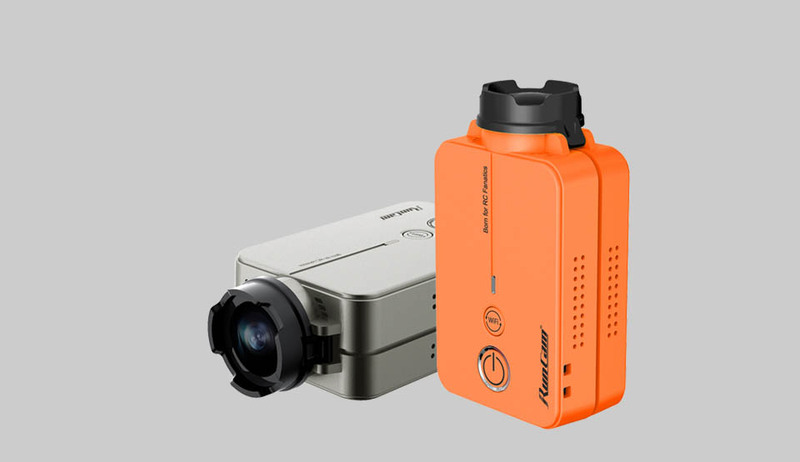 With the new RunCam 2 I don't see any reason to use the blocky and bulky competition. I just switched to this from the old Mobius w Lens A (regular). I'm very impressed with the bright & sharp video it produces. The design is good and it works very well with the cell phone app for doing the settings and making sure the view is right before you take off. Only limitation I've seen is lower video quality in very dim light (did one in a restaurant), but that is true of all small cameras. For RC it's perfect ! I did my first flight with FOV set at medium, and the scenes were excellent with little fisheye effect. Although it's rather large, the picture quality is great. At first i thought the WiFi would have a longer range, but to at least be able to change settongs on the fly was great. I had the first version, but after one crash on cement, the lens was damaged. I hope these hoods will prevent that. This is a great camera. My second (after losing one when my quad disappeared in the bush). The only critique or rather suggested addition I have is I wish there was a clip on holder to enable an FPV TX to be attached for FPV ops. This camera takes awesome video. Much more simple to use than the GoPro. And the app. For the android is unbeatable... Thank's RunCam!!!!! Cette micro caméra est parfaite, et depuis la mise à jour de l'application tous les paramètres sont accessibles. The video quality is excellent! I connect to my iPad using the app and it works flawlessly. I'm a professional Competitive Shooter and wanted a hat cam that can record a first person view of my shooting. I took it to the range for some test video and the quality of the video was amazing. The only small problem I had was the audio could be a bit better. I also like that there is an app on my phone that can change all the settings and link it to my camera. That's right, one of the best. This is a great cam. The app and functions works well. 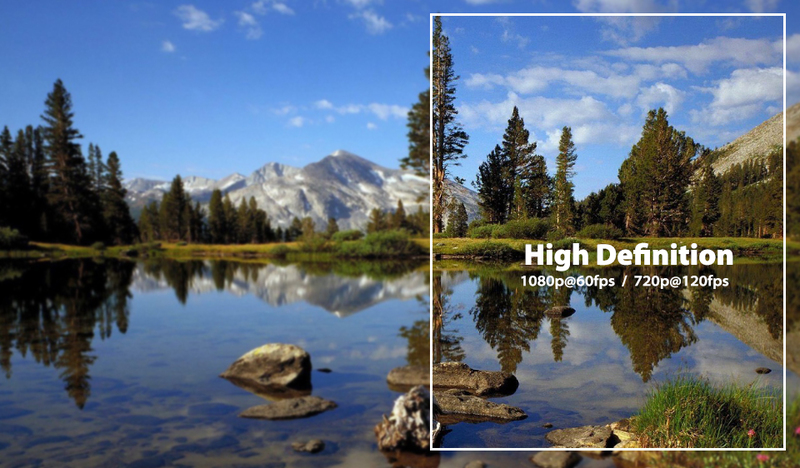 The image quality is very good and there isn't too much compression, though less is would always be welcome. Quality suffers quite a bit in low light though. The audio is very poor too; very muffled. The casing is tough and the lens protector does it's job well. 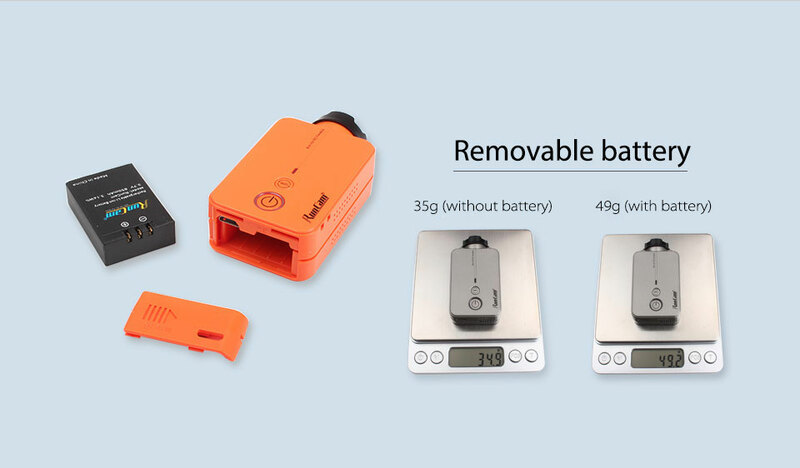 Battery life is reasonable and the lipo is easy to swap. This is a perfect cam for small racing quads where weight is a major factor. This is my second RunCam 2. The first one got destroyed in a major high speed collision with a pile of bricks when my plane nosed in from 70 feet. This camera is great for FPV and videos. Now that I have the remote cable I can also take photos while flying. The image I get on my 5 inch monitor with 800x480 resolution is fantastic. I highly recommend this camera. I would also like to thank RunCam for their support and great customer service team. Best company I have ever dealt with. Excellent camera, very stable, easy to set up before and in field. Well built. Great camera for FPV. High-quality, light and narrow, for a reasonable price. Great Camera and Service that went above and beyond my expectations. I ordered the Runcam 2 when they were taking pre-orders. My camera recorded and functioned fine, but it ran hot and the battery would get consumed quickly. I thought this was normal. Months later I decided to use it for fpv and noticed I do not get any video out. After posted on the RC Groups thread I was told by customer service to reach them. I did and they quickly determined i have a faulty unit and sent me a replacement Runcam 2. I was scared at first since dealing with overseas companies and service can be a pain... But when runcam said a new camera is on its way.. I was flabbergasted and delighted! Lucky for me their USA warehouse is less than a mile from my apartment! So I got the camera within 24 hours. It outputs video to my fpv transmitter perfectly and runs cool to the touch with better battery life. I couldn't ask for a better customer service experience. I highly recommend their quality products and friendly service. I will happily continue to buy runcam products. Captures some time the trip and others times not. 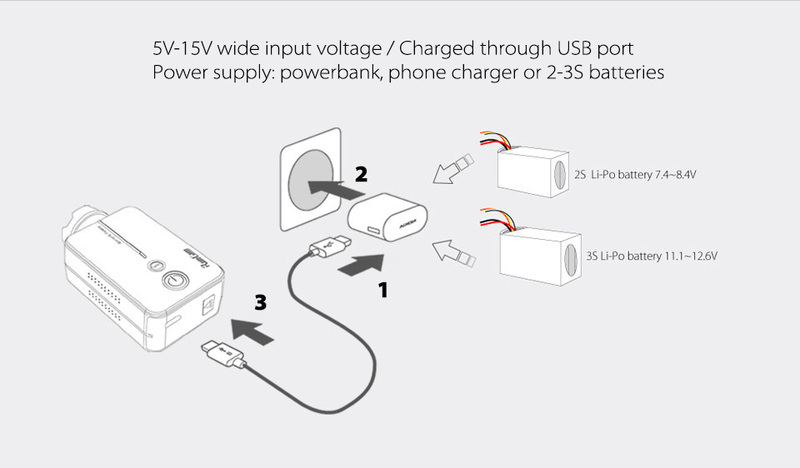 Instructions tell you to use without battery when plugged into power supply, but it is touch and to if it works that way. I bought this camera for FPV to save some weight compared to my Gopro 3 black. Quite happy with this purchase. If the PAL output gets corrected in a future firmware update to 25/50fps it would deserve that fifth star. I wanted a small, easily mounted camera for Air to Ground Photography. This one is very good and I am glad I ordered the optional mounting system. The iPhone App works well for set up. You must ensure the battery in the camera is fully charged for the WiFi. It is tough, does a nice video, great for racing drones. I use the RunCam 2 to take videos of my son while we play outside together. The image quality is great and the sound is not bad at al. My only gripes are the battery life is rather short, and that there is no separate charger for the batteries. That said, if you plan in advance you can change batteries on the fly so it's not that big of an issue for me. I brought the Runcam2 as a replacement for the Mobius that cooked itself after a mediocre crash on my Quadcopter. I like the lens protector and the robust construction of the Runcam and the bold colour that is easy to find when the camera is crash ejected. The SD card is also locked in behind a snug rear compartment door so it isn't thrown away in a crash as well. Picture quality is very good and is on par with other better Action cameras. 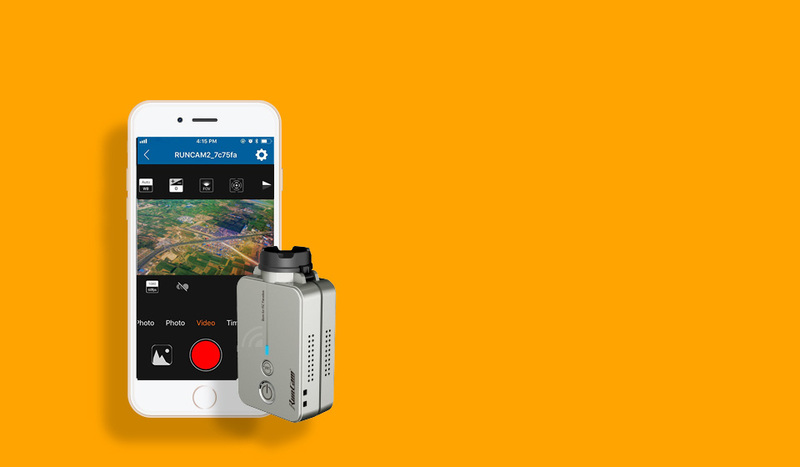 The Runcam2 feels sturdy in your hand and will run on 4s (if you want to remove the battery) and use the separate power wire. I have not used the Wi-Fi function. 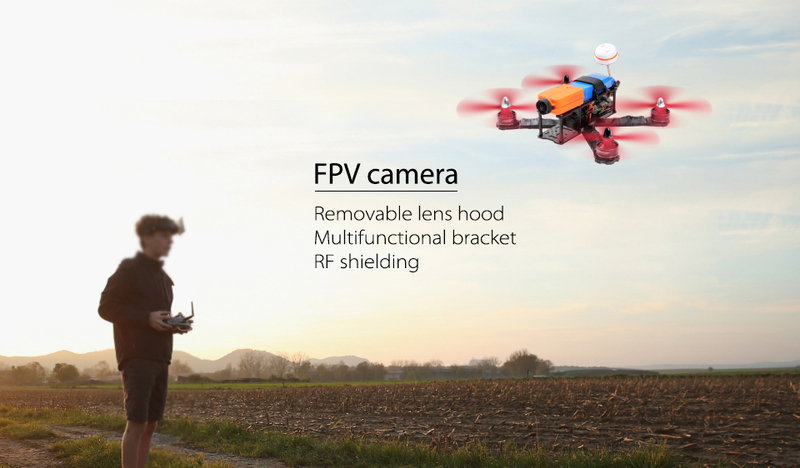 It is a very good camera for FPV (you could even use it as your flight camera to as the latency is minuscule). I got this camera because I was disapointed in a similar form factor camera ( from another manufacturer). 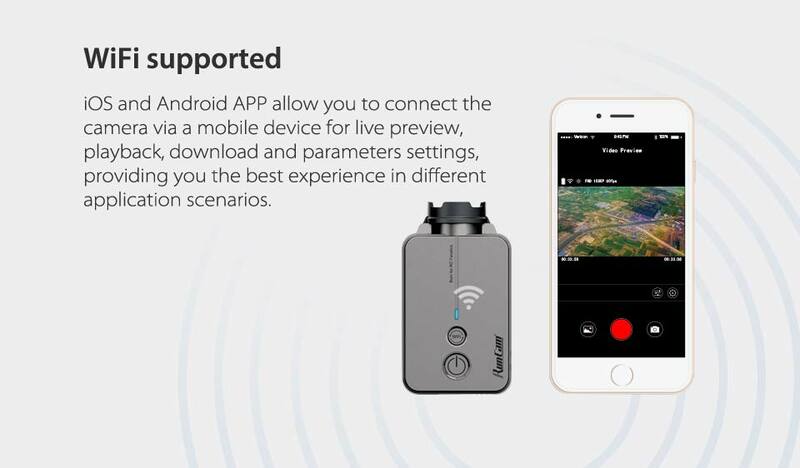 It has a great wide angle view and the best thing is that you can use the App on your Android or IOS device to view what is seen by the camera in realtime. Connecting over WiFi is done very easily and in comparison with other 2 button only camera's it is very user friendly! I have yet to connect it to my FPV quad, but my first indoor and outdoor tests show good movie quality, I would recommend this camera to anyone looking for something light and easily usable! Oh, and I love the orange color! I choose this camera after look for some kinds of this cameras. I'm really happy with my decision. It's a great camera. Wifi option and app is a good tool to config the camera very easy. The quality of films are fabulous. Compare to the Runcam, RunCam2 is smoother for the video clip. Contrast, Saturation is very nice. I do racing quadcopter so Runcam 2 is one of my choice to record flying footage. It is lightest compare to Yicam (75gr) and GoPro(86gr). Price is very competitive and acceptable with its quality. A back lid is a very clever to keep the MicroSD not to pop out off the camera when it got hit. The bad part is the dimension is vertical instead of horizon like Yicam and GoPro, so it requires more space on my drone and left a very narrow room for the drone lipo battery. Get a lens cap and the mounting accessories work fine, this cam beats the go pro i paid MUCH more for hands down! Excellent video quality. I run this cam for POV paintball/airsoft applications. The field of view is great, light correction and image stabilization are all great for this application. With the additional mounts available for purchase, the possibilities for use are endless. 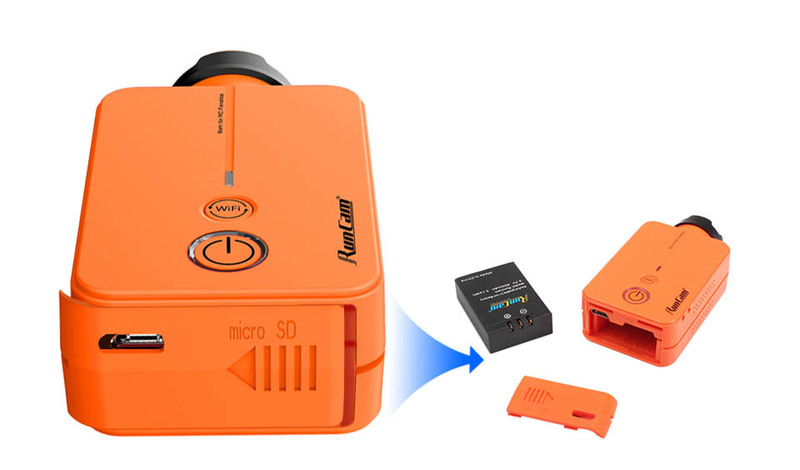 I had a break from the Runcam HD cams as version one was not living up to my expectations, I recently bought 2 of the Runcam 2's and found them to be a great little camera, great picture, well built, love the removable battery idea and the fact the cam comes with a whole heap of useful goodies is a bonus. Only two thing sI can say that I don't like is that sometimes when you crash your multirotor the battery inside the cam must move just that little bit that it disconnects power and you lose the awesome crash footage. Second is the sound ..granted you get wind noise while zooming along on a quad but it is also a lilttle muffled. After I updated mine to get rid of the bullseye effect I have been rather pleased with the video quality. Although I have seen a few hiccups with *mine* at least. When I attempt to play a video back via wifi the video never plays back smoothly and buffers often. I'm not sure if that is common but I have tried several different devices and same results. Even in the middle of nowhere and it's the only thing broadcasting wifi, same problem. At best I just use the app to make sure the image I want to capture is in frame. Another thing I have noticed, but is not a big surprise is that if the camera has a good enough jolt while recording the SD card seems to move internally and it will corrupt the file and I will have to reformat my SD card before its ready to record again. That is when the Wifi capabilities comes in really handy. With that being said my Runcam 2 has taking a few good tumbles and once was ejected from a crash into a dry river bed full of rocks and came out just fine, got really lucky on that one. One of my favorite things about the camera is the Bright Orange color. It really makes locating it much easier and the battery door that covers the SD card really gives a piece of mind that I don't have to do additional search patterns just to locate my stuff. Additionally I have heard about some people not liking the audio quality and I agree it is muffled compared to other cameras but I actually like that rather then overly loud noise of my quadcopter. I understand if someone wanted to record audio/video for purposes other than just R/C models and really would like better audio, but for my application I like the muted audio that it has. Overall I'm very happy with my purchase. Now to get an owl!